The Land of 5000 Dawns is a part of Ireland’s Ancient East but with a focus on the North East Coast of Ireland. This area outside Dublin runs along the northeast coast and contains some of Ireland’s most historic sites and breathtaking scenery. 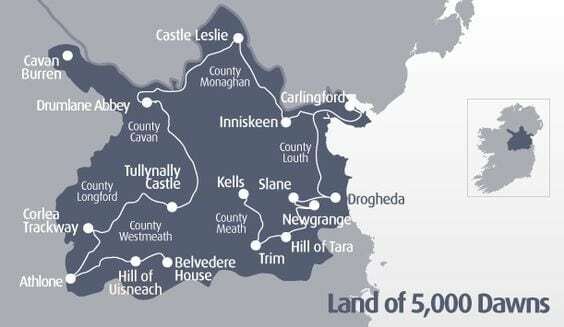 The Land of 5,000 Dawns includes well-known sites that you can visit outside Dublin such as Newgrange, the Hill of Tara, the Battle of the Boyne and the Boyne River, Trim and Slane Castles. This area of Ireland has much to offer and many hidden gems that tourists may have missed in previous visits. From stunning natural scenery to wild camping, ancient megaliths and literally 5000 years worth of history it is a part of Ireland that needs to be discovered. This section of Ireland’s Ancient East encompasses Cavan, Longford, Louth, Meath, Monaghan and Westmeath. One of its main highlights is that of Newgrange in Co. Meath, the world-famous passage tomb built in 3200 BC, making it older than the Pyramids. Another must-see is the beautiful Cooley Peninsula, found in the medieval town of Carlingford that, along with its stunning scenic views and picturesque setting, is home to the legend of Fionn MacCumhail. Belvedere House also cannot be missed, with its gorgeous Victorian walled gardens and woodland trails. Built back in 1774, it is dubbed one of Ireland’s most dramatic family houses and has a fascinating history to discover. Malahide is a beautiful castle tucked into a beautiful 22 acres just north of Dublin’s city centre. Malahide is a huge turreted castle whose history stretches back to 1175 and has been in the Talbot family for over 800 years. Legend has it that on the morning of the Battle of the Boyne in 1690, 14 members of the family sat down to breakfast in the Castle. By dinnertime, 13 of them were dead. If you have the energy to explore more after visiting the castle pop down to the village of Malahide itself. Very popular with day tripping Dubliners the village has some remarkable Georgian architecture and great cafes and pubs. 20 of the best Pubs in Dublin for music, food and craic. Both areas originally formed part of the historic Kingdom of Meath (Midhe ‘middle’). It was named Mide because the kingdom was located in the geographical centre of Ireland (the word. Meath It is only one of two counties to have an official Gaeltacht outside of the West of Ireland. 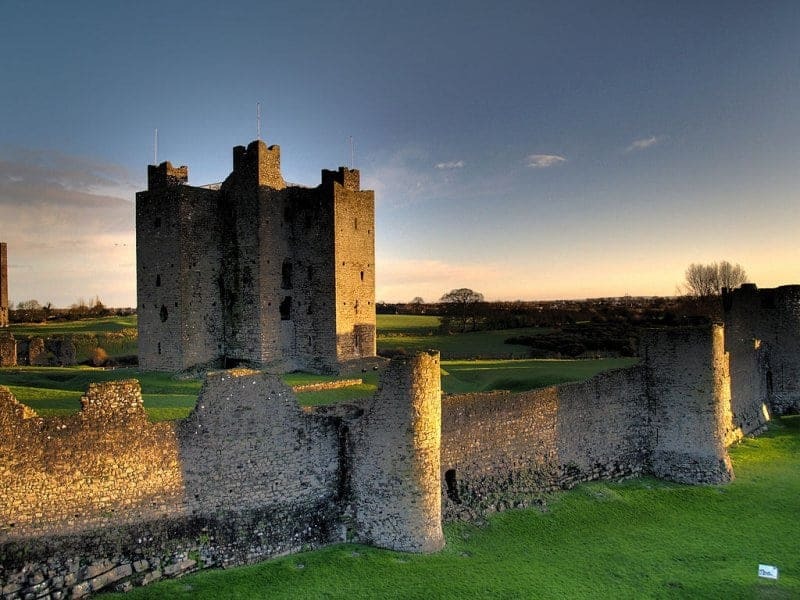 Trim Castle is where the movie Brave Heart, Mel Gibson’s Scottish epic was filmed. The castle is open to guided tour only and takes around an hour and a half. There are some who say the Castle is haunted Monks have been seen wandering throughout the ruins and guests in the Trim Castle Hotel (which is across the road) and some have seen nuns praying at the foot of their bed in the hotel. The hotel sits on the grounds of an old Cemetery for nuns. Tara is the ancient Irish seat of the High Kings. It is a huge site that is continually being investigated archaeologically. Tara encompassed the Ráth of the Synods, The Mound of the Hostages and the Stone of Destiny or the Lia Fáil. When you are in the area, you must visit the Battle of the Boyne centre, which commemorates the biggest battle in the history of Ireland that took place in 1690. There is a lot to learn here, some great displays, and an audiovisual display with a huge three-dimensional map of the battle. The grounds are pretty spectacular as well. Mellifont Abbey is a 12th-century Cistercian abbey with an incredible set of ruins that are quite breathtaking. There is an octagonal lavabo, which is an ancient washing place for the monks before meals. The arches are quite Romanesque and the carvings really detailed. You can hear the river whispering in the background and if you listen carefully, you can just imagine the chanting of monks as they went about their daily routines. The Loughcrew megalithic site is comprised of a series of tombs spread across the hills. The most important one, known as ‘Cairn T’ is open to the public. You can go inside and see the hollow shape inside the rounded tomb. There is artwork carved onto the stones inside. The most interesting thing about the tomb is that the passage lines up with the sunrise of the equinox like Newgrange’s. Tucked away just outside Castlepollard in Co. Westmeath, Tullynally Castle is a 300-year-old country house. With 12 acres of gardens, which you can get to after you, have some lovely tea and scones. The Castle is open from April to September. The tour of the gardens and grounds includes a treasure trail for the kids, stone gargoyles, a grotto and fountain, woodcarvings and Llamas. While in Athlone, be sure to visit Athlone Castle. Here you can take an audiovisual tour that lasts approximately forty-five minutes. South of town along the river Shannon you can visit the early Christian ruins of Clonmacnoise which include a cathedral and 7 churches. North of Athlone you can see the magnificent Lough Ree, which has hundreds of island and a must visit. Dún na Sí Amenity & Heritage Park which has a ring fort, a forge and rich birdlife. Mullingar is the county town of County Westmeath in Ireland. The town was originally named Maelblatha and takes its modern name from a mill noted in the legend of Colman of Mullingar. A must visit in Mullingar is Belvedere House and taking in the tragic story of Lady Belvedere and her imprisonment at Belvedere House. The Belvedere Follies and the Jealous Wall are two Irish curiosities on the Estate. A Folly is, of course, an ornamental building that serves no purpose other than its a beautiful decoration on many of the fine estates of Ireland and the U.K. The Jealous Wall well here at Belvedere House this is a “ruin” that was built with the intent of screening out the view from one brother’s house to another brother’s property. You have to see it to appreciate it. And speaking of buildings are you looking for a great hostel to stay at while you visit Ireland? check out Booking.com great list of budget-friendly places to stay. Mullingar has a number of neighbouring lakes, Lough Owel, Lough Ennell and Lough Derravaragh, which attract anglers. 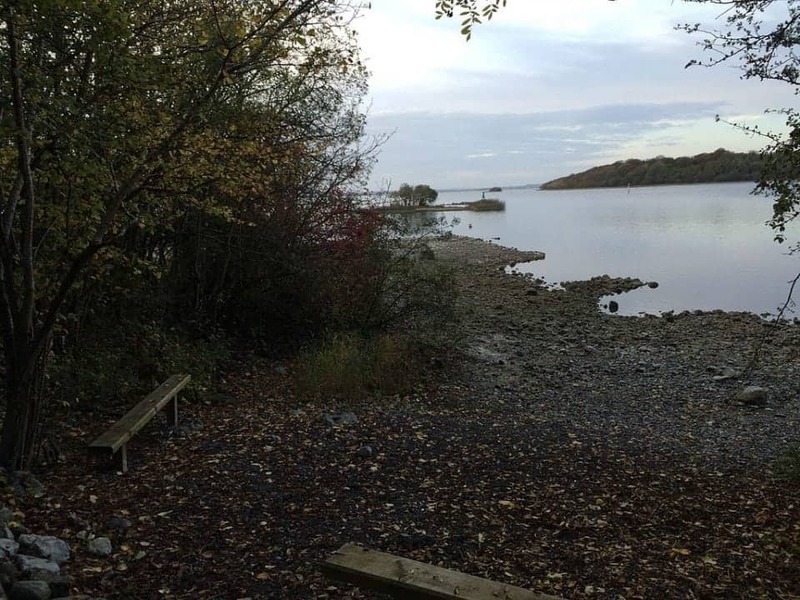 Lough Derravaragh is also known for its connection with the Irish legend of the Children of Lir. Lough Ree the Lake of Kings is in the midlands of Ireland, the second of the three major lakes on the River Shannon. Lough Ree is the second largest lake on the Shannon after Lough Derg. The other two major lakes are Lough Allen to the north, and Lough Derg to the south, there are also several minor lakes along the length of the river. The lake is popular for fishing and boating. The lake supports a small commercial eel fishery and is locally famous for its eels on wheels truck. The island of Inchcleraun in the northern part of the lake is the site of a monastery founded in the early Christian era and contains the remains of several ancient churches. In Irish legends, it was on this island that Queen Maeve was killed. The Viking Turgesius controlled a Ringfort on the shores until his death by drowning in Lough Owel. Known locally as “Quaker Island”, it is one of the more historically interesting islands of the many on the lake. With the remains of seven churches, including monastic settlements, Inchcleraun is an example of how Ireland got its nickname of “the land of Saints and Scholars”. In the middle ages, Inchcleraun was a place of pilgrimage and religious learning. Today, the island is something of a hidden gem, since very few locals, let alone tourists have visited its shores. Between 800 and 1300, the island and its churches were repeatedly plundered and burned by invaders, so the buildings are in ruins today. Not the same as the Burren on the Wild Atlantic Way the Cavan Burren Park is within the Cuilacagh Mountain Park Range. This incredible megalithic site was found in the 1870s and until as recently as the 1950s was farmland. Cavan Burren Park opened to the public in May 2014. The site itself is probably around 340 million years old. It dates back to the Carboniferous period when the area was covered in a shallow tropical sea. There are a great interpretative centre and five walking trails around the park. You can see some remarkable tombs, ancient geologic sites and the park itself has a wealth of stories. 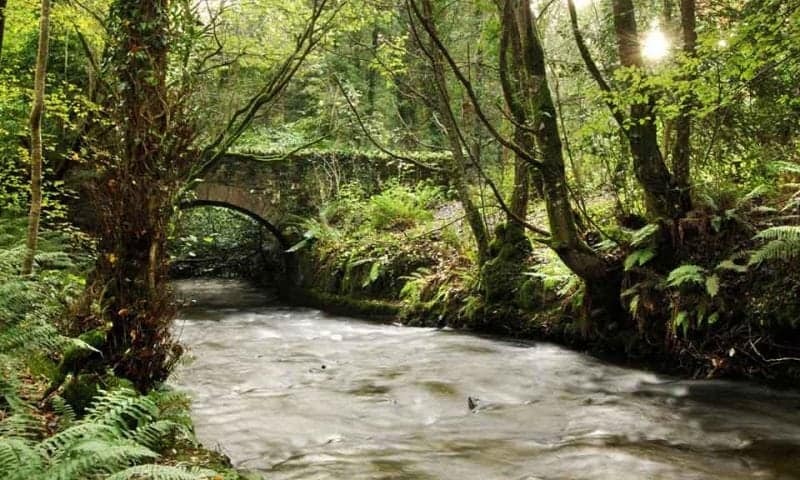 Cabra is set in the beautiful Dun Na Rí Forest Park. The Castle is actually two castles, one now converted into a luxury hotel the other a crumbling ruin. Cabra is set in the 565 acre Park that is a National Forest. Local legend would have you believe that a true Romeo and Juliet story is the centre of the ghost haunting Cabra. Castle Trail at Castle Saunderson Demesne, Belturbet, County Cavan, Located on the northern frontier of Ireland’s Ancient East, on the border between Cavan and Fermanagh, in the heart of the UNESCO Geopark, the story of Castle Saunderson is marked by fire and blood, conquest and division, and, finally, peace, reconciliation and multi-4 culturalism, with an international scouting centre opening adjacent to the castle in 2012. Take a wander through time at Drumlane Abbey, located just outside the village of Milltown, and overlooking picturesque Garfinny Lough. Drumlane Abbey, Church and Round Tower are believed to have been founded by St. Colmcille and date from 555AD. 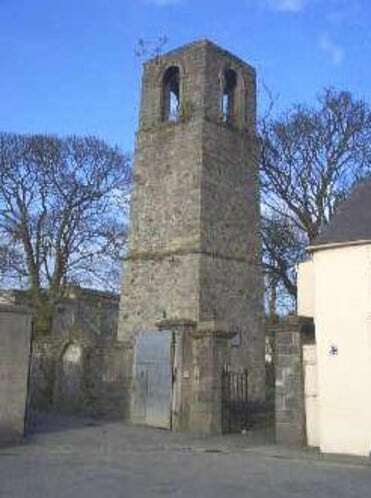 The Round Tower at Drumlane is the only one of its kind remaining in the diocese of Kilmore. All that remains of the 13th-century Franciscan friary the town of Cavan grew up around is an ancient bell tower, next to the grave of 17th-century rebel leader Owen Roe O’Neill in Abbey Street’s cemetery. St. Kilian’s Heritage Centre celebrates the life, work, martyrdom and cult of St. Kilian who was born in Mullagh, Cavan in 640 AD and the Heritage Centre celebrates his life and work in the area. County Longford is the home of the legend ‘The Wooing of Étain’, which is a tale that spans over a thousand years, and is a tale of the lives and loves of the beautiful Étain. Recounted in the Yellow Book of Lecan, one of the earliest surviving manuscripts, it predates all the Irish stories of renown. The Book of Lecan holds a special place in the celebrations of Samhain in Ireland. It is a tale of the Tuatha De Dannan, the fairy people of Ireland who resided in the sídhe; portals to the underground world of the fairy people. Longford, historically known as ‘Annaly’ or ‘Anghaile’ is a tranquil and mainly low-lying county, renowned for its angling, boating and outdoor activities. It is located in the heart of the ‘Lakelands and Inland Waterways’ region, making it a superb location for those that love all kinds of water-based activities. Aughnacliffe and Cleenrath portal tombs. The Village of Aughnacliffe is home to the Aughnacliffe and Cleenrath Dolmens, two of four portal tombs in County Longford dated to 3800BC. The dolmen in Aughnacliffe gives the townland its name “The Field of the Stones”. Longford’s most unusual ancient site is the Iron Age trackway at Corlea near Kenagh. Dating from 148 B.C., it is the largest and most impressive of many toghers or bog trackways found in that area, and one of the largest known in Europe. There is general agreement that it was not built for practical use, but its purpose remains unclear. There is a fantastic Visitors Interpretive Centre here. One of the more unusual and controversial archaeological features is the Sheela-na-gig, consisting of a female figure exposing her genitalia. There is one clear specimen in Longford and that is on the ruined Rathcline Church, near Lanesborough, believed to date from c. 1200. The early church and monastic sites include Ardagh, founded by St Patrick; Old Clonbroney, close to Ballinalee; and Ballinakill, near Killashee. The Motte and Bailey castle site at Granard is one of the finest of its type in Ireland and an impressive reminder of the Anglo-Norman presence in the region. Built around 1199 by Norman Knight, Richard de Tuite as part of an initiative to extend Norman control over the country, it was erected upon and within a pre-existing ringfort or ráth, which may have belonged to a local branch of the Farrell clan. The Motte is a great flat-topped, circular earthen mound, on top of which would have been a timber tower surrounded by a palisade. Across the base was a U-shaped bailey, an enclosure surrounded by a palisade ditch. Animals and soldiers were housed in the bailey. It is very strongly fortified except on the southern side, which seems to have been guarded solely by the deep trench on the summit, out of which defenders fired arms and hurled stone missiles at the approaching enemy. There were medieval monasteries at Abbeylara, Abbeyderg and Saints Island. The Augustinian Priory of Abbeyderg is located in the cemetery of Abbeyderg about 5 km from Kenagh village. 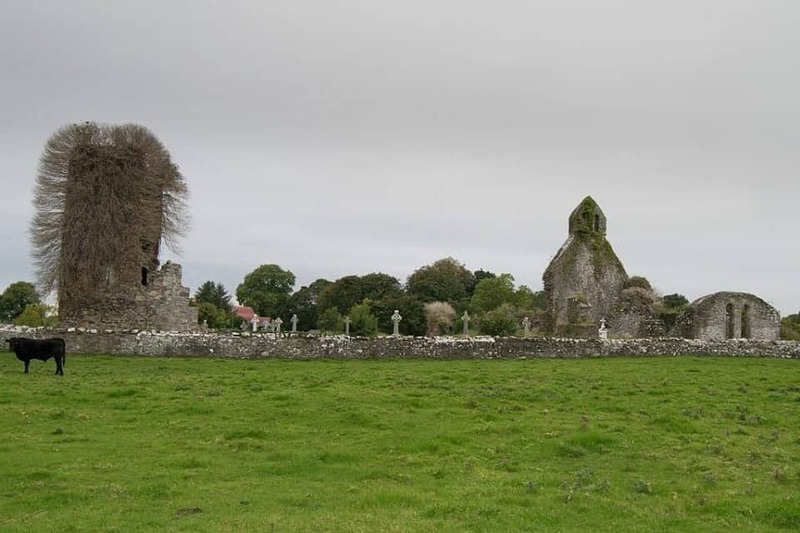 Gormgal O’Quinn, Lord of Rathcline, chief of Muintir Ghiollagáin, founded the priory in the 13th century. Known as Mainisterderg or Dearg it was dedicated to St Peter. The Abbey remained in existence until 1540 when it, along with four other monasteries in the Annaly region, was surrendered to Henry VIII. An Abbey was founded in Abbeyshrule in 1200 under the patronage of the O’Farrels of Annaly. It was colonised by Cistercian monks from Mellifont. In 1228, the affiliation changed to Bective Abbey. All that remains today is the ruined rectangular Abbey church, with traces of a cloister garth to the south, the foundations of the Presbytery and evidence of a south transept. The county has strong associations with the legendary Queen Maeve who, according to the famous epic Irish tale, An Táin Bo Cuailgne, camped overnight with her armies in Granard while en route to stealing the sacred ‘Brown Bull of Cooley’. There’s no corned beef and cabbage in Ireland – here’s why. Laragh Heritage Village in Monaghan is home to some cool little sites. Beautiful stone buildings a unique Tin Church is known as St Peter’s built from discarded tin leftover from the tin mining areas. This area was home to a hive of industry back in the 1800s from woollen mills to corn mills this is a great little detour to take when exploring Ireland’s Ancient East. Viator has loads of great tours of Ireland both north and south. You can visit all the castles and sites you want to see with one of their tours. Simply click the Viator button to see what’s on offer. Visit Castle Leslie (or even stay there) this great castle is still owned by the original family that traces its roots back to Attila the Hun. The Castle has hosted a myriad of celebrities from Mick Jagger to W.B. Yeats; in fact, Paul McCartney married Heather Mills here. You can stay at the castle and indulge yourself in the spa or take some cookery lessons. There is also an on-site equestrian centre and it’s haunted apparently. While you are in Monaghan stop by the village of Carrickmacross where you can pick up some gorgeous handmade lace. An art that dates back to the 1820s in this area. The medieval town of Carlingford, County Louth. Idyllically set close to the Irish border, the coastal town is surrounded by the waters of its Carlingford Lough and is just a stone’s throw from the beautiful mountains of Slieve Foy. The name goes back to its Viking roots for ‘fjiord of Carlinn’. It is a really picturesque town with has maintained its medieval heritage with Taaffes Castle, the Mint, the Thosel, Dominican Friary and King John’s fortress. You can see King John’s Castle when approaching Carlingford it tends to dominate the village. Sitting on top of a rocky outcrop it overlooks the lough and is said to have hosted King John of England for a few days in the early 13th century. The highest peak in the Carlingford Mountains, Slieve Foye is best accessed by a well-marked walking route (follow the blue arrows) and rises to 589 metres directly over the lough. The mountains are ruggedly beautiful, and have an interesting history, including the story of the battle at Maeve’s Gap. The legendary Queen of Connaught camped there while her massive army tore a pass through the Cooley Mountains as an insult to Cúchulain and the Red Branch Knights of Ulster. Discover a 5,000-year-old Megalithic burial tomb and deserted 19th Century farmsteads and cottages that pre-date the Great Irish Potato Famine. Home to the legends of Fion MacCumhail who rests on Slieve Foy and the epic tale of the “Táin Bó Cúailgne” also known as “The Cattle Raid of Cooley”, which tells of Cúchulainn’s defence of Ulster against the invading armies of Maeve of Connaught this area, is full of Irish legends. Bounded by Carlingford Lough and Dundalk Bay, there is roughly 60 square miles of mountains, plains, valleys, forests and beaches. You can spot castles, ringforts, Neolithic tombs, medieval buildings and more. This doesn’t even begin to cover all the sites you can see in Ireland’s Ancient East, Land of 5000 Dawns. Take your time, slow down and see the real countryside of Ireland, these are places that tourists miss when they are in such a hurry to get to the “famous sites” of Ireland. Contiki does some fabulous Irish tours including a St. Patrick’s Day one in Dublin check them out and see what you can find. Have you been to any of these areas? What was your favourite part?